I'm a bit surprised with NORML's less than encouraging comments regarding the grassroots effort from the Seattle group. I think the culture in Seattle is such that they can get the signatures they need. 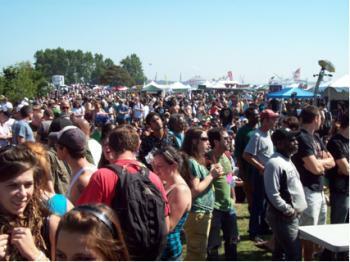 They have a lot of hard working passionate activists, they've hosted the "World's Largest Hempfest" for the past 18 consecutive years and have good leadership. The Marijuana News Channel fully endorses I-1068. after the fact of passage of this initiative. The initiative, as it is written, is really all that is needed. Regulation will just allow government to find all kinds of reasons and ways to restrict one or more of the aspects legalized by this effort, such as how and where and how many for cultivation, transfer, use, paraphernalia, or other things like where one may use or not, etc. ; and add taxes (WA is one of the most highly taxing States in the union, they've just notified citizens that we no longer can expect to get away with driving 1-5 mph over the limit because they are avid for more revenue, thanks to our massively overspending governor who got her office the same way Bush got his -- recounting the votes over and over until it finally came out the way she wanted, with her the winner). Uzz is also correct, WA is very pro-legalization, so I-1068 will pass if it gets on the ballot (and I don't see any chance of failure for getting enough signatures, either, even people who don't indulge are signing the petitions). We are starting to get it here in Washington. Does not make sense what ACLU is saying. Some legislators at the court house are saying it too. "You gotta go thru legislation..."
This is not about money anymore. We now have 20% of the alloted signatures for the ballot. It has been about a month since the signature gatherers started. And that is 20% of the higher number not even required. The ACLU was good. Will the ACLU re-consider their decision to support I-1068? The response to this petition is enormous. It seems to be narrowed down to the sane and the insane. The west coast will be green...again. As a libertarian I support anything that affects my freedom of choice. We as Americans need to be aware that our freedoms are being progressively stripped away. It makes me sad that more people know who’s on American Idol or Dancing with the starts then are familiar with their own Bill of Rights or Constitution. This goes beyond your right to smoke. I encourage all of you to seek out alternative news sources. The main stream media is just as much a corporate puppet as the people you have voted for. People have been trained to think that they have a choice in the matter. We treat party lines like a personal religion and don’t look beyond that. People its doesn’t matter if its Coke or Pepsi, your still getting COLA!!! I like the idea of going to gun shows. These people know that the 2nd amendment is not for you to have a gun and protect yourself from someone breaking in your home. It’s so that you can protect yourself from your government!!! Fallow the money… look at where your taxes go, State = roads and schools, Corporative = civil defense, Personal income tax goes to pay back the FED, the fed is not federal. Please take time to look at more then the right to smoke, look at all your rights because they may not be here tomorrow. It’s a very big thing. I am sure that during WWII that people thought they knew what was going on… but they didn’t and for some it was too late. I hope that you will vote for personal freedoms when the opportunity arises and fight to keep the ones that are left before they are taken. PS get to know BILL HICKS search for video on him. I'm disappointed by NORML's position to not even point people toward the initiative unless/until it qualifies for the ballot. Reminds me of 1972 when NORML did almost nothing for what became California's Proposition 19 until it was clearly going to qualify and NORML helped out a little to save face. I-1068's effect is the same as CA's 1972 Prop 19 with one major improvement and that initiative got about 39% of the vote. I don't know NORML's budget so won't criticize the lack of financial support but not creating great awareness of it and where Washington residents can go to learn how to help qualify it is short sighted and practically undermining it. I hope this isn't a repeat of 1972's lack of support for CA's Prop 19 that had a partial basis in the initiative being created by a different reform group, AMORPHIA, and fear of an initiative losing as a setback to reform which NORML was pretty much convinced would only come from lobbying legislators. I hope NORML will rethink it's position on publicizing I-1068. I-1068 provides as much of a reasonable regulatory system as the the Bill of Rights does. Actually a bit more as it specifies it doesn't remove criminal penalties for public safety issues like impaired driving and specifies an age limit for non-medical use. Is the Washington ACLU's lack of support because I-1068 doesn't create a regulated commercial system? Washington's alcohol regulation is badly flawed by the state monopoly on alcohol over a certain percentage IMO but that's hardly relevant to the American Civil Liberties Union anyway. Freedom is the issue. The ACLU has stood up for protection of many liberties without insisting on regulations created by those who exercise the liberties. Indeed, it's protection of liberties has mainly been through opposition to oppressive regulations. The Washington chapter of the ACLU really needs to rethink it's position. The ACLU needs to get A CLUe. I am boycotting NORML.... I understand, and disagree with them on ALL issues! They have taken our money and have been given tons of free support, THEY JUST LOST ALL OF MINE. I will be taking they website link off my website and will no long donate any more money to them. It is simple, they ask for support and money for something many think is lost cause, and here was a chance to shine and help push a initiative that has more potential then any others previous in Washington. ****BOYCOTT NORMAL**** EMAIL THEM, LET THEM KNOW! They can't use US them turn away when we ask them for support! [email protected],Vancouver,B.C.CanadaHaving cannabis cafes and a medical marijuana system that is actually starting to help numbers of people,we here sometimes forget just how difficult the struggle in the States has been and still is.I still read of sentences in the numbers of years for possession of pot,mostly in the southern states and the bible belt.We are still waiting to hear when the heroin maintenance program will find the funding to get moving.Any philanthropist with a wish to see this program off the ground can write me and I'll put you in touch with the right people.Big pharma has jumped in with a synthetic thc program,costs in excess of anything a medical marijuana program would cost but being a test the drug costs are covered by pharmacare.I am on the cannabis side of this one.The THC either knocks you out for hours or it does nothing.Cannabis,on the other hand can be smoked to whatever level of medicated the client wants.Best of luck south of the border.It would be nice to be able to cross the border for the first time in 30 years.I hope an end to prohibition will put an end to the closing of the border to those of us with drug records,a lot of them as old as Nixon's drug war. How do I sign for this or vote for this, I would really like to help out and know of a lot of people who would as well. Please let me know. It seems today that the only people who are actually against Marijuana have never tried it, and don't even know what they are talking about. Don't get me wrong, and brainless monkey can repeat what they are told, "Marijuana is bad" how? It seems that any one who is against it is doing nothing more than what they are told because they dont know any better. It's rather pathetic isn't it? So it is up to us, the few and the proud, to fight for our freedoms against the over whelming power of ignorance. Never give up hope and don't back down!!!!!!!! We will win in time. After all, even brainless monkeys know that they can't win forever. This is the URL for I-1068 sponsor, Sensible Washington. The site has info on meetings, where to sign, how to volunteer, how to donate, how to register to vote online, where to turn in petitions and such. A PDF copy of the petition can be downloaded. I burned it to a CD and went to a photocopy shop that could print petions from a PDF. It's very important to have it printed at the full 11" by 17" size as a double sided sheet that meets the legal requirements and make sure signers are registered voters in Washington before signing. Even a single signature will help if that is all you can manage. The Secretary of State has information on Restoration of Voting Rights which has been greatly changed and local Elections Offices have copies of an ACLU pamphlet on this. A lot of people who can vote again don't know their right to vote has been restored. I picked up copies of the pamphlet along with voter registration forms at the courthouse to carry with petitions so people who want to sign but aren't registered voters can fill out the form and then sign the petition. Make sure they know the registration form has to be returned within 5 days to the address for their county and if mailed they have to put a stamp on it as well as fill out which address it goes to. I've got a zippered translucent green plastic paper holder from an office supply store that I can easily carry petitions, pens and voter registration forms in. It protects them from rain and I have folded petitions arranged on each side so people can see the front top that says I-1068 and Marijuana Reform Act in large letters. I can be shopping or walking around with this and people may ask me about the petition and sign it even when I'm not actively petitioning. Spreading the word about the initiative and the site is helpful also. Calm letters to the editor that are persuasive without offending people are also helpful. Visit the site at http://sensiblewashington.org/ and think about how you can help. If you own a store in Washington and willing to keep petitions there for people to sign that would be a great help, especially if you'll let the site list your business as a place to sign. If you belong to a band or something perhaps you could help create a free event where people can come to be entertained and to sign the petition. These are just a few thoughts about how to help get the petition qualified. Wanting it to get on the ballot isn't enough, sign it and gather valid signatures. If you're not from Washington you can still help spread the word or donate, it's a volunteer effort but there are plenty of necessary expenses and things like advertising in local papers that would help but would also cost money to do.